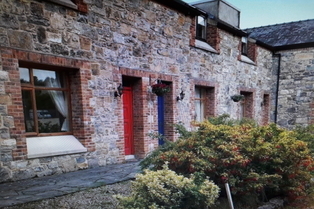 Market-House Apartments is located in Ballinamore Co Leitrim. It is a Family run business which started up in 1996 by Mr & Mrs O Rourke and has been thriving ever since. They ensure a warm friendly stay that will keep you smiling for the duration of your stay with us. Market-House Apartments was originally a market house for farmers and craftsmen to buy and sell their goods. When it closed down it was turning into the Market-House Apartments a family run business that offers you a friendly and peaceful stay. It is located in the heart of Ballinamore town and is walking distance from all local shops, restaurants, library, post-office and local pubs. Each house has two bedrooms one with either two singles, or single and bunk bed and double with one double bed or with one double and one single. One bathroom in each house with kichen/living room and laundry room is located on site as well. Apartments are located beside Supervalu and across from local Chinese takeaway away and are about a five minute walk from everywhere in the town. Private car parking is available and is hidden from all town traffic. Perfect for family get away or relaxing holiday.